Where do I use my Graze voucher code? 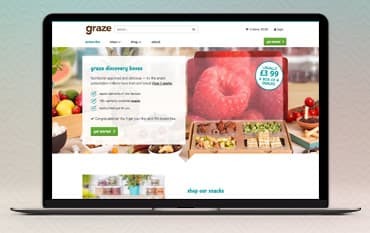 Select your Graze deal from the listings here at NetVoucherCodes. Copy your code and follow the link through to the Graze website. Select your snacks and add them to your basket. Continue through to your basket and click the ‘Add a promo’ dropdown and paste your discount code into the box provided. Your discount will then be applied and you can continue to checkout. Graze boxes are packed full of healthy nutritional treats that makes snacking (grazing) a guilt-free pleasure. Graze delivers a wide range of snacks and treats to tantalize any taste-buds and with the option to try “new” snacks and then rate them, with “try it”, “love it” or “like it”, you can guarantee you’ll be sent the things you love. Ordering is easy with a variety of delivery options from weekly to fortnightly, plus you can have your box delivered to work if you prefer. The boxes themselves are eco-friendly having been made from recycled products and then being able to be recycled again. The company works with only the finest ingredients and have their own chefs who come up with new and tasty treats. All the boxes have a handy guide enclosed, giving the nutritional elements of the snacks and their use by dates for best consumption. When it comes to snacking, why not do it in a healthy & nutritious way which won't leave you feeling guilty! With Graze, you can choose from a wide range of delicious snacks including the Graze Brownie, Flapjacks, Dried fruits, Olives, Breadsticks, Pistachios, banana bread and so much more! Many including less than 100 calories, whether you've got a sweet tooth or prefer something more savoury, there is something at Graze to tickle your taste buds. Check out the collection on Graze Snacks today and select one of our money saving Offer Codes to add on to your order. Ensure your next Graze box is filled with all your favourite fillings by choosing the right Graze box to suit your taste buds! The best way to explore all the snacks Graze has to offer is by choosing the Maximum variety box. Bursting with a variety of all the Graze favourites including sweet and savoury, this box combines all the best snacks without sticking to one flavour or category. If you're watching the waistline then the Lowest Calorie Graze box would certainly be ideal for you. Featuring a selection of delicious snacks which are all under 150 calories they're equally as tasty, minus the guilt! Perhaps you're in search for some protein fuelled snacks, the Graze selection of over 25 snacks each including a source of protein would be perfect for fuelling your busy life! Browse the whole collection now! Graze deliver custom-made food boxes containing fruits, nuts, vegetables, seeds and savoury snacks to your work or home. Grab one of our Graze discount codes and you will save money on your Graze order. Make sure to save money by using one of our Graze Promo Codes. Graze is all about healthy eating, so choose your favourite selection and munch them at your desk!